With Christmas and the New Year around the corner, this is undoubtedly the time for celebration, fun ‘n’ frolic, parties and Carnival. 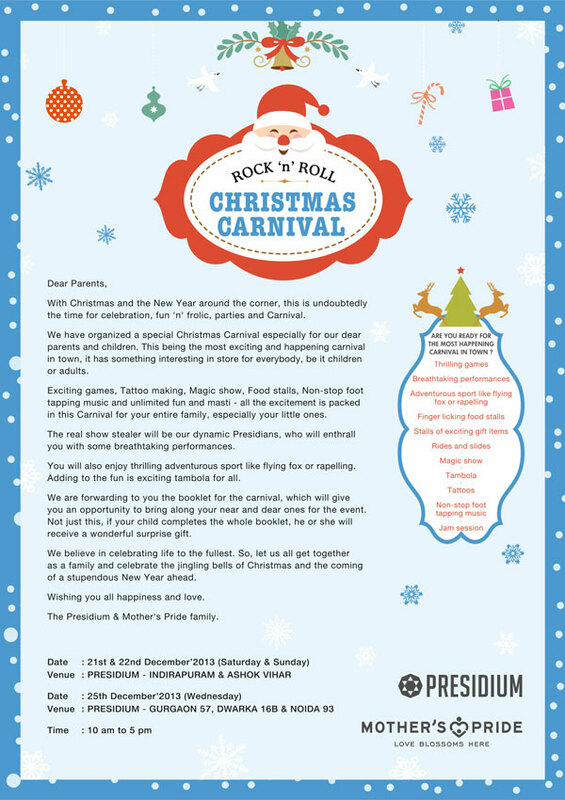 We have organized a special Christmas Carnival especially for our dear parents and children. This being the most exciting and happening carnival in town, it has something interesting in store for everybody, be it children or adults. Exciting games, Tattoo making, Magic show, Food stalls, Non-stop foot tapping music and unlimited fun and masti – all the excitement is packed in this Carnival for your entire family, especially your little ones. The real show stealer will be our dynamic Presidians, who will enthral you with some breathtaking performances. You will also enjoy thrilling adventurous sport like flying fox or rappelling. Adding to the fun is exciting tambola for all. We are forwarding to you the booklet for the carnival, which will give you an opportunity to bring along your near and dear ones for the event. Not just this, if your child completes the whole booklet, he or she will receive a wonderful surprise gift. We believe in celebrating life to the fullest. So, let us all get together as a family and celebrate the jingling bells of Christmas and the coming of a stupendous New Year ahead. Wishing you all happiness and love. The Presidium & Mother’s Pride family.